ICFP Programming Contest 2011: Official Site: Task description - contest starts now! Task description - contest starts now! Welcome to the ACM SIGPLAN ICFP Programming Contest 2011! 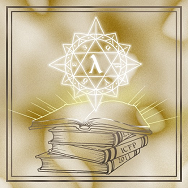 The task this year is to write a program that plays the card game Lambda: The Gathering (LTG for short). Each match of LTG is played by two programs (player 0 and player 1) in alternate turns (turn 1 of player 0, turn 1 of player 1, turn 2 of player 0, turn 2 of player 1, etc.). Each player owns 256 slots, numbered from 0 to 255, and a fixed set of cards. A slot consists of a field and an integer called vitality, ranging from -1 to 65535. A field holds a value, which is either an integer, ranging from 0 to 65535, or a function (in the sense of programming languages). A value is a valid slot number if it is an integer greater than or equal to 0, and less than or equal to 255. A slot is dead if its vitality is 0 or -1; otherwise the slot is alive. At the start of each match, every field is initialized to the identity function (a function that takes an argument x and returns x) and every vitality is initialized to 10000. 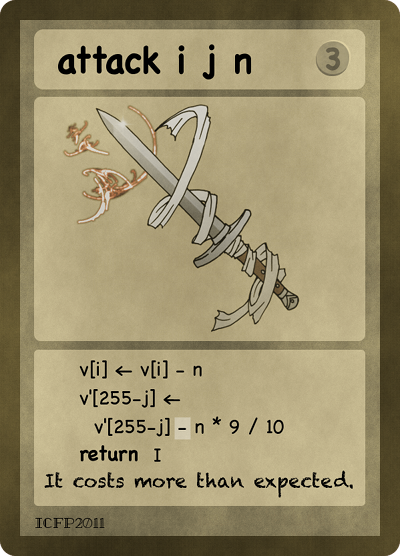 The cards have fixed values as defined below. The turn ends when an error is raised, when the number of function applications caused by the left or right application (including itself) exceeds 1000, or when the left or right application returns a value without exceeding this limit. In the last case, the field of the slot used for the left or right application is overwritten with the return value. In the other cases, it is overwritten with the identity function. Effects caused by function applications are not rewound and remain even if an error is raised or the application limit is exceeded. Cards are not consumed by applications and can be reused as many times as necessary. A match ends after 100000 turns of each player, or when every slot of a player has become dead after a turn. In either case, a player wins if it has more slots alive than the other player. The players tie if the numbers of slots alive are equal. 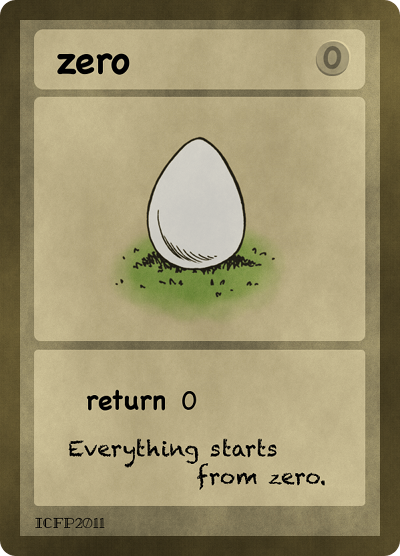 Card "zero" is an integer constant 0. 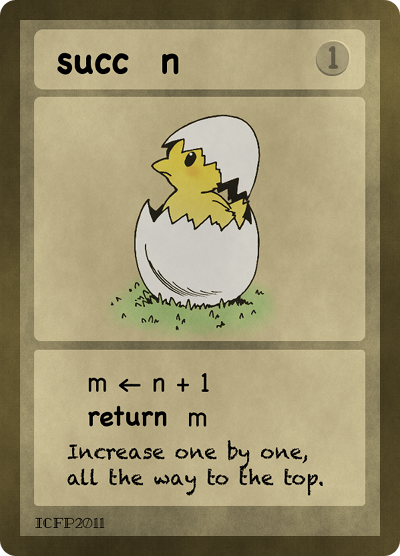 Card "succ" is a function that takes an argument n and returns n+1 if n<65535 (or returns 65535 if n=65535). It raises an error if n is not an integer. Card "dbl" is a function that takes an argument n and returns n*2 (n times 2) if n<32768 (or returns 65535 if n>=32768). It raises an error if n is not an integer. Card "get" is a function that takes an argument i and returns the value of the field of the ith slot of the proponent if the slot is alive. It raises an error if i is not a valid slot number or the slot is dead. Card "put" is a function that takes an (unused) argument and returns the identity function. and returns the identity function. and return the identity function. 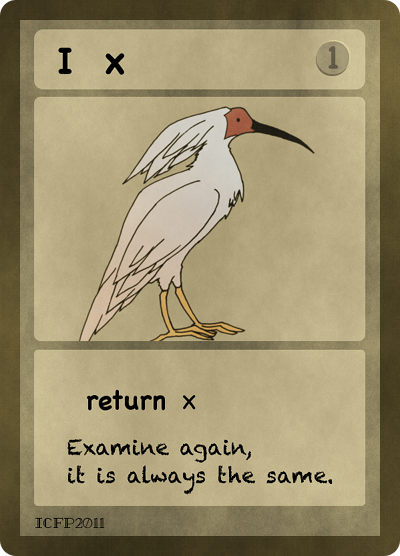 Card "copy" is a function that takes an argument i, and returns the value of the field of the ith slot of the opponent. It raises an error if i is not a valid slot number. Note that the slot is ith, not (255-i)th. 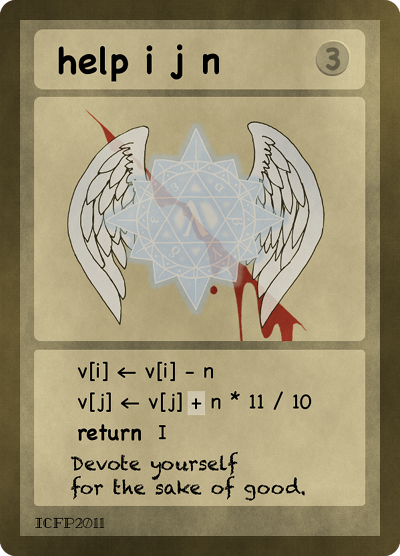 Card "revive" is a function that takes an argument i, sets to 1 the vitality v of the ith slot of the proponent if v<=0 (or does nothing if v>0), and returns the identity function. It raises an error if i is not a valid slot number. and set the vitality of the slot to -1, and return the identity function. Immediately before each turn of a player, the field of every slot of the player with vitality -1 is automatically applied (as a function) to the identity function (even though the slot is dead) in increasing order of slot number. [Update on 07:05 June 17 Friday UTC: The vitality of each slot is checked just before its automatic application; that is, (1) the vitality of slot 0 is checked, and (2) if it is -1, the field of slot 0 is applied, and then (3) the vitality of slot 1 is checked, and (4) if it is -1, the field of slot 1 is applied, etc.] For each of these automatic applications, an error is raised if the field is not a function or the number of function applications caused by the application exceeds 1000. An error caused by each automatic application does not affect any other automatic applications. After each automatic application, the field of the slot used for the application is overwritten with the identity function, and the vitality of the slot is reset to 0. 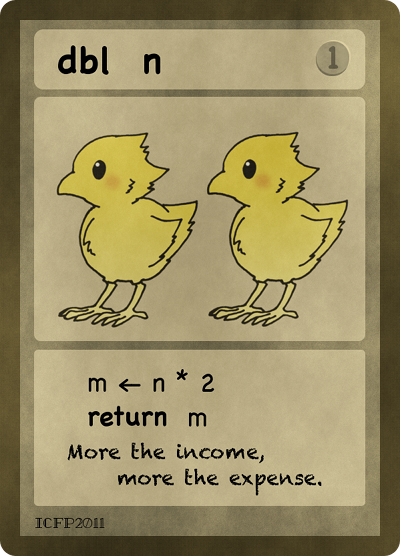 Card "inc" decreases the v (in the previous description of this card) by 1 if v>0, or does nothing if v<=0. Card "dec" increases the v by 1 if v>0 and v<65535, or does nothing if v<=0 or v=65535. 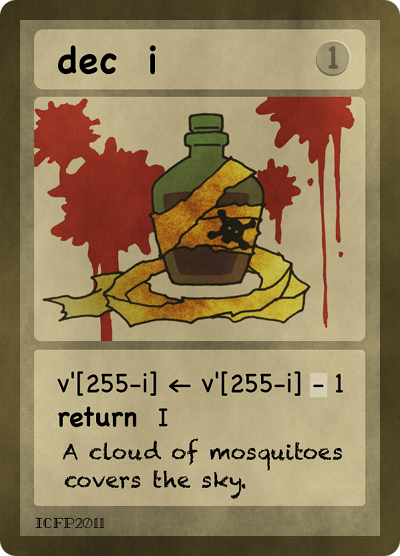 The third function in card "attack" increases the w by n*9/10 if w>0 (w is set to 65535 if it would become greater than 65535 by this increase), or does nothing if w<=0. The third function in card "help" decreases the w by n*11/10 if w>0 (w is set to 0 if it would become less than 0 by this decrease), or does nothing if w<=0. (1) apply card to slot, or (2) apply slot to card? Another example session (with unilateral turns by a solitary player, which is not part of the official rules) follows, again for an informational purpose only. It shows how to compose (as functions) the field of a slot with a card, as well as how to apply (as a function) the field of a slot to that of another. The last example shows how to implement an infinite loop. Please try to minimize the installation procedure: for example, avoid compiling your program from source code and include a precompiled binary as far as possible. 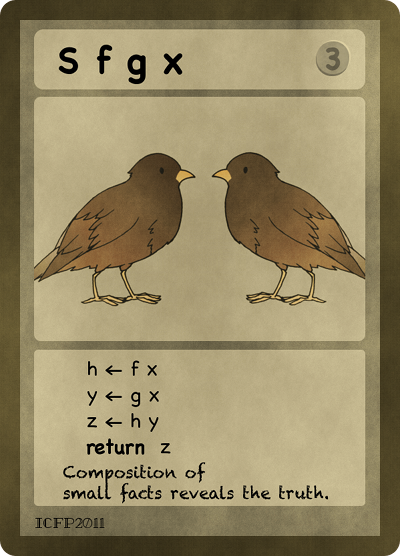 the digit "2" (meaning right application) and the line feed character '\n', followed by a slot number and '\n', again followed by a card name and '\n'. other dynamically linked 32-bit libraries (and any other files required at runtime but unavailable on Debian squeeze for amd64) can be included in the submission itself. Additionally, the archive may include an optional "./README" file, explaining the most interesting aspect(s) of the submission. This file will be used for determining the discretionary judges' prize. Submitted programs are evaluated in two rounds. In the first round, each program plays as player 0 against n randomly chosen distinct programs as player 1. The number n will be at least 15 and determined by the judges considering the number of submissions and the actual time required for the matches. In each match, 6 (resp. 2) points are given to player 0 if it wins against player 1 within (resp. after) 100000 turns, and 1 point is given to player 0 in case of a tie (in this round, no point is given to player 1). The programs are ranked by the total points. Judges' prize will be determined discretionarily on the basis of the optional README files and the submissions themselves. Questions about this task description can be posted as (moderated) comments to this post or e-mailed to icfpc2011-blogger AT kb.ecei.tohoku.ac.jp. Please use the latter if your question includes spoiler information. Cool problem! Thanks for coming up with it. It says that a turn ends when an error is raised, and errors can be raised by automatic applications of slots with -1 vitality, but do not affect other automatic applications. Do these errors end the turn — i.e., can you prevent your opponent from playing by zombieing their slots with crashers? No, as the task description says, the automatic applications of zombies happen _before_ a turn and do not prevent it. It's not clear how we can see what the opponent has performed during their turn. I know it says that card images are just for amusement, but it looks like the image for "put" card does not correspond to description. Please read the section "Submission". > I know it says that card images are just for amusement, but it looks like the image for "put" card does not correspond to description. You are right. The task description is correct. We'll fix the image to avoid confusion. Thanks! I'd like to clarify `attack i j n' and `help i j n'. Each of these involves changes to some slot `i' and another slot `j'. If `i' is not a valid slot number, do the changes to slot `j' still take place before the exception is raised? If `j' is not a valid slot number, do the changes to slot `i' still take place before the exception is raised? Thanks. For attack and help cards, one of the steps is "do nothing the the slot is dead". Does this refer the the proponent's slot i, the opponent's slot (255 - j), or the slot currently being either right or left applied? 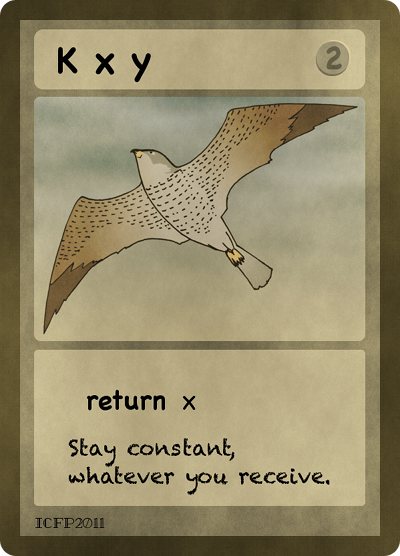 It means the opponent's (255-j)th slot in "attack" and the proponent's jth slot in "help". What is a directory where "run" file is executed? Question regarding automatic applications. Suppose "attack" is applied to some value, yielding another function. If this function is applied during an automatic application, will the behavior be the modified one or the original one? > Question regarding automatic applications. 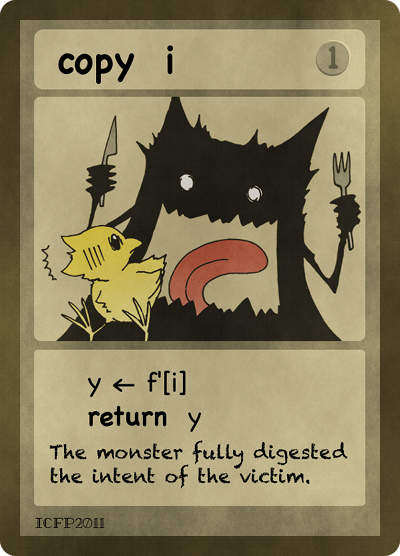 Suppose "attack" is applied to some value, yielding another function. If this function is applied during an automatic application, will the behavior be the modified one or the original one? The former, that is, the behavior changes. > What is a directory where "run" file is executed? Your home directory, that is, the home directory of the unique general user assigned to your submission, in which the .tar.gz archive is expanded. Is there any validation tool to ensure that submission is correct (in context of its format). If slot k has vitality of (-1) before a turn, and as a result of an automatic application of slot j (<k) k's vitality is no longer (-1), does an automatic application still happen on k? > Is there any validation tool to ensure that submission is correct (in context of its format). If I steal a revive card from the opponent using copy, will it revive my slots or him/her when applied? 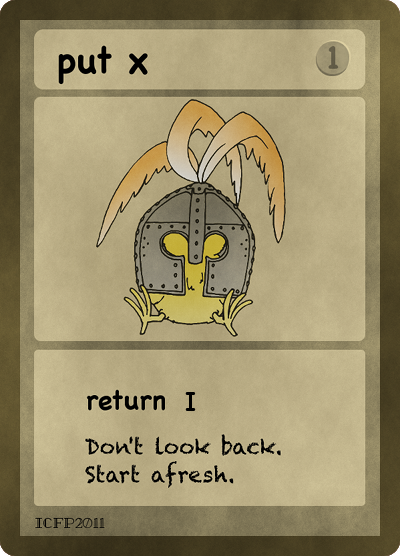 > If I steal a revive card from the opponent using copy, will it revive my slots or him/her when applied? The former. "copy" only steals a value (not the effect), and the effects of cards are fixed (e.g. "revive" always works on the proponent, i.e. the player who applies it). > If slot k has vitality of (-1) before a turn, and as a result of an automatic application of slot j (<k) k's vitality is no longer (-1), does an automatic application still happen on k? No, the vitality is checked before _each_ automatic application. The task description is now clarified (Update on 07:05 June 17 Friday UTC). Thanks! I suppose the following scenario describes zombie functioning. Player0 raises a zombie in player1's 13th slot. At the beginning of the next player1's turn this zombie is applied with proponent=player1 and opponent=player0, so when zombie executes 'inc', player1 suffers. > Please correct me if I'm wrong. I suppose the following scenario describes zombie functioning. ... Player0 raises a zombie in player1's 13th slot. At the beginning of the next player1's turn this zombie is applied with proponent=player1 and opponent=player0, so when zombie executes 'inc', player1 suffers. About attack: can one suicide using it (by having n equal to v) or not? In other word, is the "greater" in the text "strictly greater" or "greater or equal"? > About attack: can one suicide using it (by having n equal to v) or not? In other word, is the "greater" in the text "strictly greater" or "greater or equal"? The "greater" means "strictly greater". BTW, will there be a "chmod +x install run" after unpacking the submission from archive? Hi, I'm the one who complained about "put" car image being wrong, but now I realized that "put x y = y" and "put x = return I" are equivalent definitions for put function. But the latter is probably less confusing and definitely more explicit. Thanks for listening! > BTW, will there be a "chmod +x install run" after unpacking the submission from archive? >> BTW, will there be a "chmod +x install run" after unpacking the submission from archive? So "unofficial" server does that too, right? It seems (by experimenting with the interactive LTG executable), that the second argument of K is not evaluated (side effects do not appear). Is this correct? > So "unofficial" server does that too, right? No, the problem is "player 1 played an invalid hand" / "player 1 loses by invalid output at turn xxxx". Which is very weird to happen as all the program does is reading 3 lines and spamming the same three lines all over again. Can it be due to 60 seconds limit? > It seems (by experimenting with the interactive LTG executable), that the second argument of K is not evaluated (side effects do not appear). Is this correct? The application is performed as explained in the task description, namely, call by value. > No, the problem is "player 1 played an invalid hand" / "player 1 loses by invalid output at turn xxxx". the solution if the "invalid hand" seems to be a false alert. Thank you for cooperation. I am currently installing Deibian in VirtualBox, but am stuck at "Install the GRUB boot loader on a hard disk." The message box below then tells me that Debian detects that it is the only operating system on the computer (It's not, I'm VMing in windows), and then asks me if Debian should "Install the GRUB bot loader to the master boot record?" with a Yes/No option. Should I allow Debian to do this? >Card "copy" is a function that takes an argument i, and returns the value of the field of the ith slot of the opponent. It raises an error if i is not a valid slot number. Note that the slot is ith, not (255-i)th. If the ith slot of the opponent is dead, does an error raise? About zombies and attack: do I read correctly that the opponent who is running the zombie a slot decreased, and the proponent has a slot 9/10 increased? About attack and health: if 'j' does not denote a correct slot number, do I read correctly that 'i' is decreased nonetheless? > If the ith slot of the opponent is dead, does an error raise? No, it raises an error only if i is not a valid slot number. on submission page there is "URL of your submission". does this mean that i will have to upload the tar.gz file somewhere on www and give link to that location here? > About zombies and attack: do I read correctly that the opponent who is running the zombie a slot decreased, and the proponent has a slot 9/10 increased? > About attack and health: if 'j' does not denote a correct slot number, do I read correctly that 'i' is decreased nonetheless? 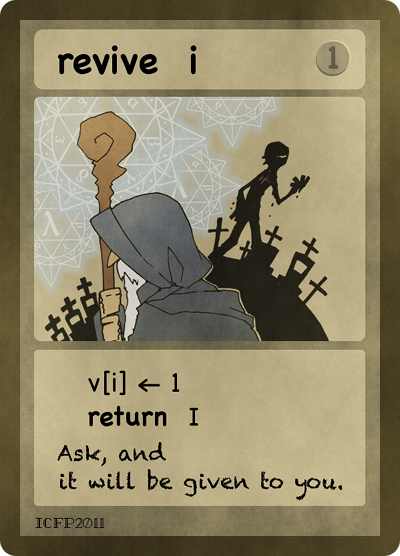 I have a question about the dynamically bound cards inc, dec, attack, help which change their behaviour during the pre-turn run. When one of these is partially applied during a turn (in context A), say "attack 0" and later during the turn (in context B) the remaining arguments are supplied, which behaviour should I see? The card description suggests I will see behaviour depending on context A but LTG shows partially applied function by name (ie. "attack 0" rather than "\j -> \n -> ...") suggesting the name might not be bound until context B. > on submission page there is "URL of your submission". > does this mean that i will have to upload the tar.gz file somewhere on www and give link to that location here? > I have a question about the dynamically bound cards inc, dec, attack, help which change their behaviour during the pre-turn run. > When one of these is partially applied during a turn (in context A), say "attack 0" and later during the turn (in context B) the remaining arguments are supplied, which behaviour should I see? > The card description suggests I will see behaviour depending on context A but LTG shows partially applied function by name (ie. "attack 0" rather than "\j -> \n -> ...") suggesting the name might not be bound until context B. It is the latter, that is, what you describe "bound under context B" (but please note that the task description does not use such a notion as binding of cards or their names). Could it be possible to have a little bit of information as to why a run is "invalid" on the test server? It could be "Broken Pipe" (the program quit), "Timeout" (took too long), or "Parsing" (could not parse the output). We have just noticed that our runtime requires X to be running; since some errors are reported with dialogs. Will the test server have an X server available? What if exactly 1000th application has side effect? Will evaluation be aborted before or after that application? > What if exactly 1000th application has side effect? Will evaluation be aborted before or after that application? Not before. Please read the Rules carefully. I second the question: what is "invalid"
and the ltg.linux executable don't seem to emit it. raised, but this does not end the match? Is there any chance you could add a rankings page to the unofficial duel server showing each team's current submission ranked according to the percentage of duels won? It would be nice to see at a glance how we are doing compared to other teams. > I second the question: what is "invalid"
3) The player's output did not conform to the format specified in the "Submission" section. 4) The player exceeds time limit or memory limit. If a submission performed something invalid 3 times, that submission will not be used in the unofficial duel server anymore. It does not end the match. Per the response to Vlad's comment above, I see where the spec says "... exceeds 1000", but it is still not perfectly clear whether the side effects of the 1001st application (if any) persist. Technically, I recognize that to "exceed 1000" applications, the 1001st application must have taken place. But, since function application seems to be an evaluation process, which may sometimes terminate abruptly, it is unclear whether the application has taken place at the beginning of evaluation (before side-effects), or only when evaluation is complete (after side-effects). Right. Thank you for pointing it out. > Could it be possible to have a little bit of information as to why a run is "invalid" on the test server? It could be "Broken Pipe" (the program quit), "Timeout" (took too long), or "Parsing" (could not parse the output). We are now considering to add such discrimination in the unofficial server log (but it could take time). > We have just noticed that our runtime requires X to be running; since some errors are reported with dialogs. Will the test server have an X server available? We have installed xfvb package on the unofficial duel server. We will add it to the official judge machine image, too. > Per the response to Vlad's comment above, I see where the spec says "... exceeds 1000", but it is still not perfectly clear whether the side effects of the 1001st application (if any) persist. turn ends immediately without any side-effects accompanying the 1001st application. If I start with (K zero) in a slot and in the current turn I apply that slot to a zero card, how many function applications are counted in the current turn? Only one application is counted. Zere is probably one problem with zero card. Correct me if I'm wrong. Accordingly to spec zero is always returning 0 number. However if you will call zero(I) or any other function as parameter - Native. Exception is raised. Is it expected? It looks like zero expect to see only numbers. Why? If we start with ((S S) I) in a slot and in the current turn we apply that slot to a "I" card, how many function applications are counted in the current turn? 0 is just a constant, not a function. > If we start with ((S S) I) in a slot and in the current turn we apply that slot to a "I" card, how many function applications are counted in the current turn? Just to clarify can I submit updates of my package to official server after first submission? > Just to clarify can I submit updates of my package to official server after first submission? Yes, you can update the submission by using the same password. does evaluating zero cost one application? e.g. does 'succ(zero)' cost 1 or 2 applications? No. The cost for 'succ(zero)' is 1. > Is there any chance you could add a rankings page to the unofficial duel server showing each team's current submission ranked according to the percentage of duels won? It would be nice to see at a glance how we are doing compared to other teams. We have set up a ranking page for the unofficial server: http://kokako.kb.ecei.tohoku.ac.jp/leaderBoard. About the invalid thing: if the opponent outputs an invalid string, will it be passed to the proponent before it is checked? To give a concrete example: when we read what the opponent is doing, we fail (and exit the program) if it is not a correct output. Could it happen that this happens before the opponent's play is checked (thus the fact we quit is detected as invalid play)? > About the invalid thing: if the opponent outputs an invalid string, will it be passed to the proponent before it is checked? No. The opponent outputs are first checked before they are passed to the proponent. What is the output of the test server when the program takes too long? Is it also "player ... loses by invalid output at turn ..."? I want to make it clear about what the "first column" is. For example, if I use gpg to the file "submit"
Is the "first column" CF83E135 in this case? > I want to make it clear about what the "first column" is. > Copy-and-paste the first column (128 hex digits in lower case with no spaces) of the output of the "sha512sum" command (on Debian squeeze or any compatible environment) on your tar.gz file. > What is the output of the test server when the program takes too long? Is it also "player ... loses by invalid output at turn ..."? Currently yes. We will update the error message but it may take time. 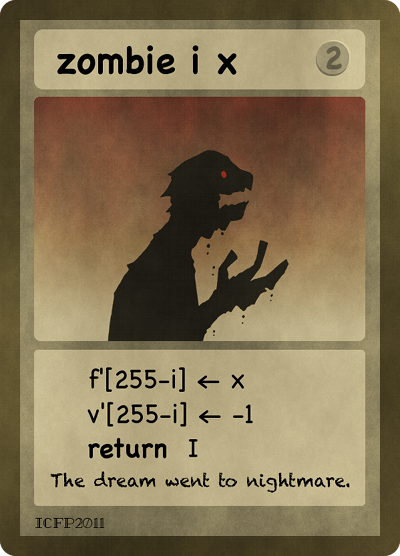 A question about the description of the zombie card: the description says that zombie raises an error if i is not a valid slot number. Isn't it (255-i)? According to the description, it seems that zombie sets the vitality of the i-th slot to -1 although the image implies that the vitality of the (255-i)th slot should be set to -1. > A question about the description of the zombie card: the description says that zombie raises an error if i is not a valid slot number. Isn't it (255-i)? According to the description, it seems that zombie sets the vitality of the i-th slot to -1 although the image implies that the vitality of the (255-i)th slot should be set to -1. No, "the slot" in "zombie" refers to "the (255-i)th slot". Note that i is an integer, not a slot. Note also that i is a valid slot number if and only if 255-i is. where X is the function we set with Zombie card and I is Identity function. So when "run" is executed with parameter "0" it should write three lines, then wait for three lines, then write three more lines and so on, while when it is executed with parameter "1" it should wait for three lines first. could you please tell me the path of python2.6 (opposed to python3) interpreter in the runtime environment? > So when "run" is executed with parameter "0" it should write three lines, then wait for three lines, then write three more lines and so on, while when it is executed with parameter "1" it should wait for three lines first. > X(I) or I(X) ? > where X is the function we set with Zombie card and I is Identity function. Please read the task description carefully: "applying f to x" means "f(x)", not "x(f)". > could you please tell me the path of python2.6 (opposed to python3) interpreter in the runtime environment? I'm getting a "500 Internal Server Error" when trying to upload my package to the unofficial duel server. Duel server is giving internal error when trying to upload a bot. > I'm getting a "500 Internal Server Error" when trying to upload my package to the unofficial duel server. > Duel server is giving internal error when trying to upload a bot. Thank you for your reports. We fixed the problem. What does the "Sorry, there is a misjudgement" result message mean ? > > About attack: can one suicide using it (by having n equal to v) or not? In other word, is the "greater" in the text "strictly greater" or "greater or equal"? > The "greater" means "strictly greater". The ltg simulator does not implement this: it is possible to suicide doing an "attack" or a "help". I'm getting "player 1 loses by invalid output at turn 1" on the duel server every time. My submission works just fine when running with the 32bit ltg on a debian virtual machine. Latest submissio ID is 919. > What does the "Sorry, there is a misjudgement" result message mean ? We had a server problem at that time. Please just ignore the entry. It shouldn't affect the number of wins/losses. It's not clear if card name is case sensitive or not. For output data it is clarified, for input it is not. > > > About attack: can one suicide using it (by having n equal to v) or not? In other word, is the "greater" in the text "strictly greater" or "greater or equal"? > > The "greater" means "strictly greater". > The ltg simulator does not implement this: it is possible to suicide doing an "attack" or a "help". Please read the task description more carefully before asking questions. Thank you for your consideration. >>Any files created by "run" during a match must be deleted by itself before or when it terminates. Does this include interpreter tokenized files such as *.pyc created by Python ? - Team Lambda Lambda Kurgan! - there can only be one! P.S. Thank you for a wonderful contest! > It's not clear if card name is case sensitive or not. For output data it is clarified, for input it is not. 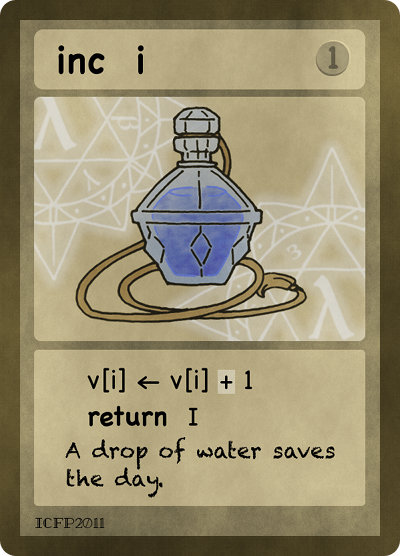 Card names are case-sensitive both for input and output. In section "Submission", "a card name" is "a case-sensitive string" as defined at its first occurrence. > I'm getting "player 1 loses by invalid output at turn 1" on the duel server every time. My submission works just fine when running with the 32bit ltg on a debian virtual machine. > Latest submissio ID is 919. Please read the paragraph "In case you can only produce 32-bit executables [...]" in the task description. > >>Any files created by "run" during a match must be deleted by itself before or when it terminates. > Does this include interpreter tokenized files such as *.pyc created by Python ? In general, "./run" should delete any temporary files it creates during a match. If you would like to share any files (such as precompiled bytecode) across matches, consider including them in the submission itself (or generating them during "./install"). Thank you for creating the leader board! I'm a little confused by its output, though. How does it pick which 30 duels to count? How frequently does it update? I would have expected it to use the most recent 30, updating whenever a duel completed... but that's clearly not the case, as my most recent submission has won all its matches since submission (OK, that's only 2 ;-) ), but I'm still listed as having 0 wins. > I'm a little confused by its output, though. How does it pick which 30 duels to count? How frequently does it update? As noted at the top of the leader board, the latest 30 valid duels in the last 12 hours of each team are considered. The ranking is updated every 10 minutes. These number may change, though. Is it acceptable for ./run to attempt to play indefinitely, relying on the game server to kill it, or must ./run terminate itself when a game is won or tied? The text for the "S" card in the specification says that it applies f to x before applying g to x. However, the ltg executable appears to do the reverse. Can you confirm that the specification is accurate about this? > Can you confirm that the specification is accurate about this? The specification is correct as it is and we are sure that ltg conforms to it. for help command, can i == j? If yes, does it the count addition after the subtraction? also, can n for attack and help be 0? submission ID is 1221... can you give me a hint? > for help command, can i == j? If yes, does it the count addition after the subtraction? > also, can n for attack and help be 0? > Is it acceptable for ./run to attempt to play indefinitely, relying on the game server to kill it? "submission does not conform to the specification" message is the result of Native.Error ? For example if apply card to dead slot it would be just reset to Identity function or player will lose with "submission does not conform to the specification" message ? P.S. Anyway, could you replace "submission does not conform to the specification" message with something a bit more informative ? 1) your program's output does not follow the format written in the "Submission" section, or your program does not output anything (please flush stdout!). 2) your program used 60 seconds in one turn. > specification" message with something a bit more informative ? however please understand some unrecognizable error may still occur. If a submission emits text to stderr, will that be ignored, or will that cause a "does not conform to the specification" error? Does Ruby environment works on unofficial server? > If a submission emits text to stderr, will that be ignored, or will that cause a "does not conform to the specification" error? Ruby should work on the unofficial server. If you provide your team name or submission id to us (by email, perhaps? ), we will investigate the reason. Can I resubmit a new solution after submitting one via the Google Docs form? Will unofficial duel server work after contest end? It is an interesting game, so we can compete even after contest. > Can I resubmit a new solution after submitting one via the Google Docs form? On unofficial server you don't get win if your opponent exceeds time or memory limit. For example duel ID = 21593. What will you do if after n games of first round where would be several tied teams for 30th place? > On unofficial server you don't get win if your opponent exceeds time or memory limit. You are right -- we'll make sure that you win in such a case in official matches. > What will you do if after n games of first round where would be several tied teams for 30th place? Please read the task description (the section on Evaluation). 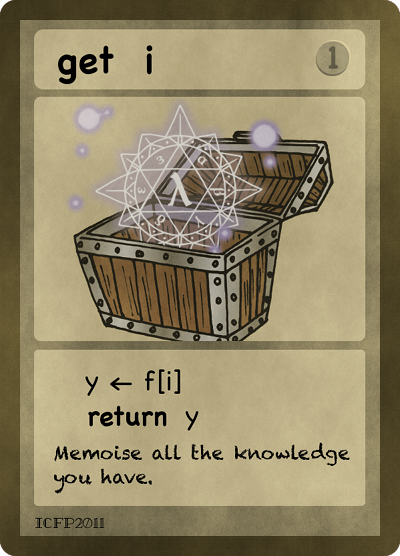 Shouln't that text on the bottom of the image of Card "get x" read "Memorize ..." instead of "Memoize ..." ? Or could you provide me with the meaning of the word memoize? My dictionary could not find it. I like your Card images very much! "Thank you for your participation to ICFP Programming Contest 2011!" on the web form. Email? > Shouln't that text on the bottom of the image of Card "get x" read "Memorize ..." instead of "Memoize ..." ? > Or could you provide me with the meaning of the word memoize? My dictionary could not find it. > "Thank you for your participation to ICFP Programming Contest 2011!" on the web form. Email? Does slot function is reset to I when slot becomes dead or revived ? Does dead slot field will be reset when your perform left or right application to dead slot ? > Does slot function is reset to I when slot becomes dead or revived ? No. See the task description. > Does dead slot field will be reset when your perform left or right application to dead slot ? Yes. Please read the task description carefully. If we implemented two bots, is it allowed to submit more than one solution per team? > If we implemented two bots, is it allowed to submit more than one solution per team? No. Please choose your champion bot! What will happen if someone other will re-submit solution under our name? As we've investigate, there is no handling of such situations. Will you keep the server alive for a few more days or weeks, so we may try to hack this SKI completely? Or would you mind to publish source code and submitted bots somewhere somewhen? > What will happen if someone other will re-submit solution under our name? As we've investigate, there is no handling of such situations. We basically distinguish submissions from different teams in terms of passwords. In suspicious cases, we will handle the situation individually by contacting the teams by emails. Could you give some details about when to expect the final and preliminary results and what information will be in preliminary results? While I am not going to submit my final product I want to thank the organizers for providing a fun, educational, interesting diversion for my free time this weekend. I also would like to thank the organizers of this contest. It was definitely challenging! Further, I'd like to thank them for leaving the duel server running; it's been nice to see the data slowly accumulate on the win/loss rate for my final submission, even past the end of the contest. I look forward to seeing the announcement of the final rankings of the official submissions... it's just sad that I'll have to wait for three months to see it. Could you please announce when you've completed fetching all the submission tarballs? I'd be a nice confirmation. There's will be nice if you'll provide some information about submissions fetching.